Join us for two days of fascinating work with Andrea Datz at Medicine Horse Program in Boulder. 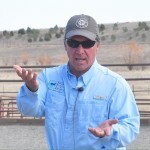 Beyond Body Language: Focused on expanding our awareness, how to make good use of our senses to guide us in identifying and working with any issues our horses may have. Develop practical skills that develop your intuition, your capacity to touch and create movement that is therapeutic in nature. Tango with Horses: Following the theme of the improvisational, social dance, Argentine Tango. These workshops focus on how we connect and move together. From ground work to the saddle, learn how to communicate effectively through how you move and carry yourself. This is the heart of compassionate horsemanship – we learn to adapt and respond fluidly to the horse’s responses to our suggestions. It’s possible to have contact without connection. Are you pulling too tightly on the reins? Are you holding on for dear life? Or are you so afraid of showing up that your horse, your partner, doesn’t even know you’re there? The reins, like words, are just the conduit for the conversation. How you sit in the saddle is more important. How much of yourself have you surrendered? Do you trust your horse to carry you? Are you breathing? Are you listening? When connection happens, your body knows. There’s power there, given and received. It can be a tentative, tenuous thing. Sometimes, less is more. It’s easy to try too hard. Just allow. Let the energy flow. Release, but don’t let go. It’s possible to have contact without connection, but it’s impossible to have connection without contact. Isn’t this the experience we seek when we ride, that moment out of time when there is no separation, when we feel in complete harmony, when rider and horse move as one? However fleeting, this is where the magic lives, the alchemy that turns two creatures into a single being. It’s the rider’s high that keeps us coming back to the barn, despite all the struggle, heartbreak and plain old hard work that can come with horses. But how do we achieve those moments of communion? Mental determination and physical ability aren’t enough. It’s not just about knowing the theory and applying the right aids, telling your equine partner what to do and receiving compliance. As any rider who loves her horse will tell you, there’s an emotional and even a spiritual component. For most of us, this is good news. It’s not about how accomplished an athlete you are or how fancy a horse you ride. But it is about relationship, trust and the ability to communicate. 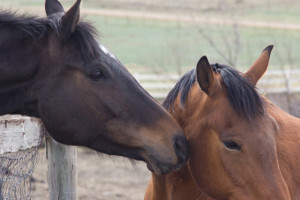 It’s about recognizing not only the positive but also the negative feelings horses and riders can trigger in each other, especially frustration. It’s about having the compassion and the self-control to diffuse the situation. It’s about being both patient and humble. It’s about vulnerability, and the willingness to seize joy when it presents itself. Mostly, it’s about coming to know your true self, by way of opening your heart to a horse. This post is the first in a series pondering the five steps involved in riding mindfully, with an open heart, which is what we seek at Anam Cara Equestrian. These steps include awareness, connection, balance, harmony and communion. 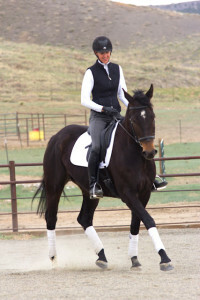 They are a little like the training scale, that well-known tool of traditional dressage, only different. Like the training scale, the steps in riding mindfully are both progressive and interrelated, meaning that although one builds upon the other, we are never completely finished with one level before moving on to the next. Rather, there is a spiral dynamic, whereby we must constantly return to the foundation, even as we seek to move up the scale. Unlike the traditional dressage pyramid, however, riding mindfully is less about training the horse and more about transforming the rider. And the horses are our teachers. We start by inviting awareness. But what exactly is awareness? Is it the same as paying attention? Yes and no. First, there is awareness of our environment, gained through our five senses: what do we see? What do we hear? What do we smell? What do we taste? All of this brings us into our bodies, so that we can begin to become conscious of what we feel. What are we aware of physically, in our own bodies? And what about our minds and emotions? What are we thinking, but more importantly, what are we feeling? Note that there is one word – feeling – for awareness of both physical and emotional sensation, they are so closely linked. For the horse, there is no distinction between the mental, the physical and the emotional; they are all interconnected. It is only our western rational minds that have been taught to create a distinction, and as direct result, we have learned to focus our awareness more and more exclusively on what goes on in our heads. The horses can teach us to dissolve the artificial boundaries between mind, body and emotion and to become aware and conscious of all at once, without becoming attached to tension, however or wherever it might manifest, either mentally, physically or emotionally. To be aware is to be present, in the moment, not brooding about the past and worrying about the future, or even reliving bygone glory and anticipating potential success. Yesterday’s spook? Forget it. The perfect canter transition three strides back? Forget it too. The nanosecond we try to capture and hold onto the past, even when it was awesome, we are pulled out of the present. Just ask any jumper rider who let savoring a clear effort over the second-to-last fence get in the way of finishing with a clean round. As for all the excess baggage about the past and future that has nothing to do with riding, yet we still bring with us to the barn? Learn to lay that burden aside. Isn’t that why we come to the barn in the first place? The baggage will be waiting for you, right where you left it, when you’re finished spending time with your horse… or maybe, just maybe, it will have disappeared while you were paying attention to something else. 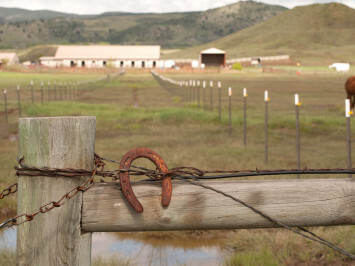 Horses are masters of presence, and the emotional agility that comes with it. As Way of the Horse author Linda Kohanov observes, “they don’t spend the afternoon ruminating over the fact they had to run from a predator, and they don’t stay up all night worrying about future encounters with lions and tigers and bears.” Whatever arises, they deal with it and then go back to grazing, enjoying life in the moment. How do we invite the awareness that fosters this kind of presence? It starts when we arrive at the barn. Pay attention to what your senses are telling you – observe, feel, listen. Have you ever noticed what a horse does when he steps off a trailer? He lifts his head and looks around, draws in a deep breath, swivels his ears, using all of his senses to take in the whole of his surroundings before plunging in. Do the same. Stop for a moment after getting out of the car (or stepping out your door if you keep your horse at home) and use all your senses to gather information. Pay attention to the vibration in the air. What kind of a day is it at the barn? Then, from this place of heightened awareness, step forward and engage. 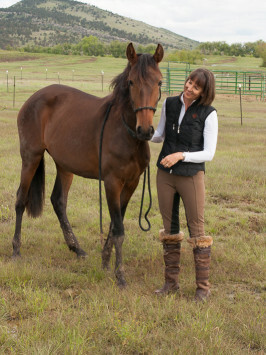 Next, at some point before you mount, take a few minutes to mediate with your horse. The benefits of meditation for overall health have been demonstrated in numerous studies. No awareness practice is as effective without some form of it. So, whether you are an experienced meditator or have always resisted the idea, give it a try in this context, for your horse’s sake. Stand with your feet hip distance apart so that you feel grounded on the earth. 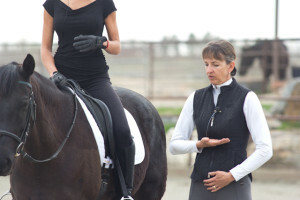 Place a hand on your horse’s shoulder or chest and quietly take several deep breaths. Allow the mental chatter to cease. Consciously lay down the burden of past and future. Acknowledge the emotions that arrived at the barn with you (or that have arisen since) and their accompanying physical sensations and then, for the sake of your horse, release them. Let any thoughts you have simply drift away without getting caught up in them. This goes especially for your agenda for your ride. For the moment, let it go. Instead, focus on your breathing and your horse’s breathing. Imagine your breath flowing into your horse’s heart and your horse’s breath flowing into your heart. 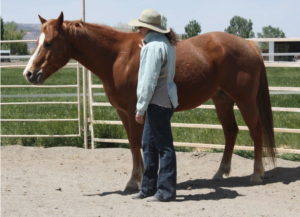 Do this when and where you’re fairly certain your horse will be willing to stand quietly beside you, perhaps in the pen just after putting on the halter or in the stall after you’ve finished tacking up. Don’t expect to achieve these few moments of peace in the midst of a busy arena (although it can be done). 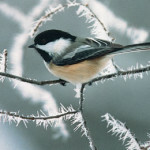 The role of the breath in fostering this level of awareness is manifold. Physiologically, breathing deeply, using the diaphragm, has the effect of stimulating the vagus nerve, responsible for controlling the parasympathetic nervous system, which in turn activates the relaxation response in the form of the release of neurotransmitters such as acetylcholine, serotonin and nitric oxide. These neurotransmitters counter the effect of the chemicals produced by the body when it’s under stress, when we tend to breath shallowly, high in our chests, or even hold our breath. Breathing deeply has a similarly positive effect on the horse’s physiology, involving the diaphragm, vagus nerve and release of neurotransmitters. When we breathe deeply and thus relax, we encourage our horses likewise to breathe deeply and relax, preparing both of us for a positive learning experience. Breathing with intention while in the saddle also promotes positive change in the rider’s heart rate variability and brainwave frequency, allowing these electrobiological functions to resonate at healthier levels which are also more in sync with the horse’s own systems. Together, you can both be more calm, more present, more aware. Just breathe. Such practice begins with presence and awareness, which in turn are rooted in paying attention to how we breathe. As my mentor James Shaw likes to say, “the breath isn’t everything, but everything begins with the breath.” So breathe, and become aware. It’s the first step to becoming one. Why do we ride? For many of us, the passion first surfaced when we were children and felt the strong and undeniable pull of horses. We all asked for our own pony. Some of us were lucky enough to have riding lessons off and on throughout our childhoods. A few actually got to have a horse. No matter, the love never went away. Now we are older. The pull is still there, the need to be at the barn, inhale the fragrance of leather and hay, and feel the exhalation of warm, grass-scented breath against our cheeks. Remember? It’s the connection, the relationship with these amazing animals, gazing at us with fathomless wisdom from liquid dark eyes. But it’s more, as well. The ride itself is integral to the experience. Being with the horse is wonderful, but for us, it’s not enough. There is a level of communion that’s only obtainable when two beings move as one. Movement in harmony creates stillness at the center. Two souls share a moment out of time. Minds present, bodies in motion — this is riding as a meditative art.